Free breakfast and historic York two-and-a-half miles away are the draws of the Deluxe Inn and Suites. 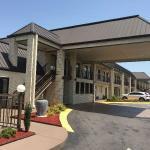 The Deluxe Inn's 50 rooms are set in a two-floor building with no elevator. Rooms feature available Wi-Fi work desks microwaves mini-fridges and flat-panel cable TVs with HBO and Cinemax. Rooms with jetted tubs and non-smoking accommodations are available. Wake up and smell the coffee at the free continental breakfast each morning. The hotel also has a 24-hour front desk. The Deluxe Inn is off U.S.-321 at the intersection of Highway 5 and Bypass 161. The center of York is two-and-a-half miles west. One of the largest historic districts in the state at 340 acres it contains over 180 historic structure and landmarks including Hart House Wilson House and York County Courthouse. If you're coming from the Charlotte NC metro area the hotel is 30 miles southwest of Charlotte Douglas International Airport and 32 miles southwest of the city center.